The Unrig the System Summit brought together top advocacy leaders, academics, actors, elected officials, philanthropists, journalists, and more across the ideological spectrum to bridge partisan divides and brainstorm concrete solutions to fix America’s political process and partisanship. At the Summit, Olikara spoke on a panel with Cici Battle, the Director of Young People For (YP4), on how to include millennials in the fight for an equitable and responsive democracy. As the largest voting bloc in 2018, millennials have the most to gain in building an inclusive democracy movement. Olikara stressed the importance of amplifying the voices of young people in the era of big-money politics. 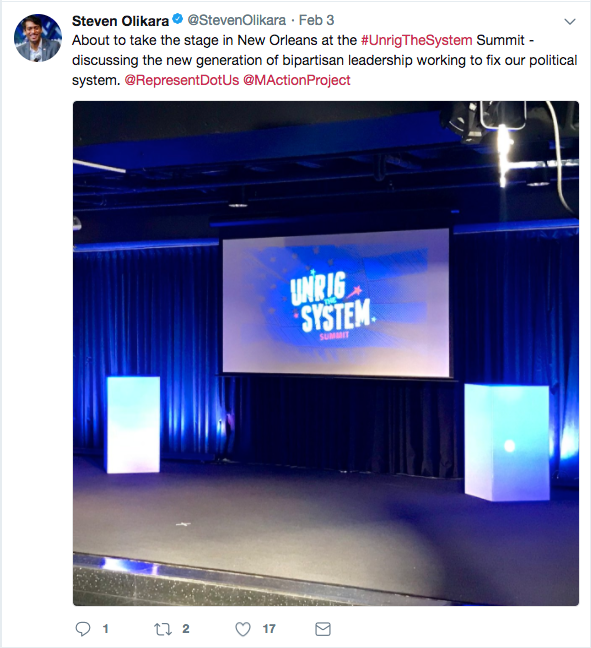 At the Unrig Summit, Olikara announced the Millennial Action Project’s new bipartisan Democracy Reform Task Force, and highlighted the myriad of new areas where millennial elected officials are transcending partisan divisions to create change. He pointed to efforts in policy areas such as campaign finance, redistricting, ethics, transparency, and voting access. Olikara brought highlighted that generational political change is key to creating concrete, post-partisan democracy reform.